Your CottonTee T-Shirt design search is complete. CottonTee T Shirt designs found. 5.4 OZ., heavyweight 100% preshrunk cotton short sleeve scoop neck T-shirt. Quarter-turned. Bound matching trim on neck. Double-needle stitched hemmed sleeves and bottom. 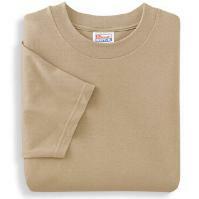 Item # JerzHvyC Jerzees Heavyweight Cotton. 363M/363B Cotton T-Shirt. 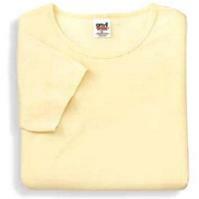 5.6 OZ., heavyweight 100% preshrunk cotton T-shirt. Ribbed collar. Taped shoulder-to-shoulder. Coverseamed front of neck. Double-needle stitched hemmed sleeves and bottom. 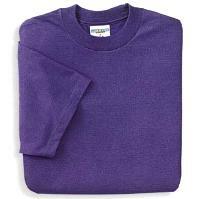 Item # FOLHvyC Fruit of the Loom Heavy Cotton. 5.6 OZ., 100% cotton T-shirt. Seamless ribbed collar. Youth has one piece seamed ribbed collar. Taped shoulder-to-shoulder. Double-needle stitched hemmed sleeves and bottom. 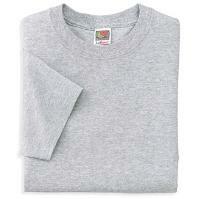 Item # Lofteez Fruit of the Loom Lofteez. 6.1 OZ., 100% cotton T-shirt. Seamless ribbed collar. Taped shoulder-to-shoulder. Fully Double-needle stitched. Youth has one-piece seamed ribbed collar. 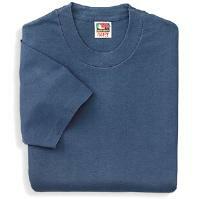 Item # GilUltra Gildan Ultra Cotton T-Shirt G200. 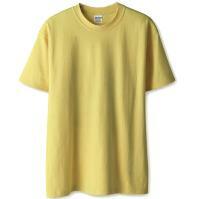 6.1 OZ., heavyweight 100% preshrunk cotton T-shirt. PFD white is bleached, regular specification T-shirt with 100% cotton thread. Quarter-turned. Seamless collar. Taped shoulder-to-shoulder. Fully double-needle stitched. 6.1 OZ., 100% preshrunk ringspun cotton T-shirt. Taped shoulder-to-shoulder. Double-needle stitched coverseamed collar. Double-needle stitched hemmed sleeves and bottom. 6 Selections returned in current search.